The Reserve at Penley Park is perfectly located in Pflugerville, Texas - a favorite north suburb of Austin. There are several beautiful acres of parkland in Penley Park. Links Lane is a 1200’ long tree-lined entry boulevard off of Gattis School Road, complete with a fantastic view of a 40-acre horse ranch on the north side. As you enter the community, there is a natural creek, parkland with trees on either side of the intersection, and a exquisitely landscaped park complete with entry monument sign as Links Lane intersects into Peach Vista Drive. Plus there is also a new park area adjacent to the garden homes and town homes. The abundance of parkland in the community is where Penley Park derived its name. Pflugerville is a paradise when it comes to parks and recreation. The City of Pflugerville has more than 15 parks, 30.5 miles of trail, 16 playscapes, 500 acres of parks and 528 acres of open space all within Pflugerville's city limits. Many of the parks offer a full range of amenities from pavilions, gazebos and playgrounds to pools and picnic areas. Pfluger Park is along Gilleland Creek and is the site of the city's annual German festival, the Deutschen Pfest, held the third weekend in May. The park includes the Fallen Warrior Memorial, trails, a grove, playground, volleyball courts, basketball court, picnic areas and large shade trees. Pfluger Park is also used for music in the park events and festivals. Lake Pflugerville is a 180-acre reservoir built to provide the citizens of Pflugerville with drinking water. The lake is open for fishing, swimming, jogging, canoes, kayaks and wind surfing. Lake Pflugerville Park includes a 3-mile walking/jogging trail, playground, boat launch, pavilion and beach area. The Northeast Metro Skate/BMX Park is a 349-acre multiple-use recreational area with soccer fields, multi-use fields, baseball fields, a cricket field, basketball court, tennis court, and a skate park. Amenities include restrooms, playgrounds, group shelters, picnic tables with grills, concession building for rent, and a water play area. Pflugerville also hosts Hawaiian Falls, a water park and adventure park. In 2015, the city purchased a 237-acre tract of land for a community park with a new sports complex and nature areas for $4.276 million. Austin area residents like to enjoy many outside activities including; hiking, bicycle riding, jogging, kayaking or canoe riding in one of more than 250 beautiful parks. Austinites also love to watch all kinds of sports, and cheer on the University of Texas Longhorns, tailgating at football games and packing the stadium. The city also hosts the X Games and Formula One races at the Circuit of The Americas. As the Live Music Capital of the World, Austin is home to banner music festivals like Austin City Limits, a two-weekend-long fall event featuring major headliners and lesser-known acts, as well as South by Southwest, an annual set of film, interactive media and music festivals held in March. Austin's newest music extravaganza, Fun Fun Fun Fest, founded in 2006, has become beloved as a pioneering festival of progressive music and comedy. Those who are hankering for a great dining experience will enjoy Austin's bustling culinary scene, featuring an endless array of delicious food trucks and high-quality, esteemed restaurants. Austinites with kids tend to live outside of the urban core. Parents regularly take advantage of the city's wide range of kid-friendly events and activities, from free museum days to outdoor festivals to natural attractions, like watching the world's largest bat colony emerge from a bridge downtown at dusk. 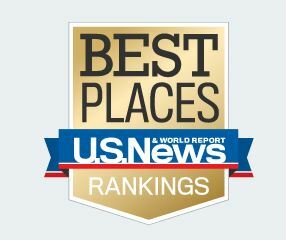 In 2017 Austin ranked #1 in Best Places to Live by US News & World Report. So, what's it like to live in the greater Austin area? In a word, Amazing! Austin's attractions cater to all ages. With an abundance of green space, active travelers can bike in Zilker Park and swim in Barton Springs Pool before an evening of bat-watching at the Congress Avenue Bridge. If you find yourself waking up to a rainy day, stay dry in one of Austin's top-notch museums like the Bullock Texas State History Museum or the Blanton Museum of Art. Just make sure you save some energy for an evening of live music at a bar or club on 6th Street. As an additional bonus, Austinites' pocketbooks benefit from no personal or corporate income tax, and a low state and local tax rate.